Professor Dr. Walther Burckhardt studied law at the universities of Leipzig and Neuchâtel. After graduating in 1893, he continued his studies in Berlin and Bern. His doctoral dissertation was supervised by Eugen Huber in 1895 and addressed the legal nature of the personal associations in the Swiss Code of Obligations (OR). One year later, he wrote his Habilitation in the field of legal history and private law. 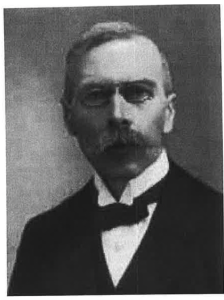 After several years as an assistant at the Federal Department of Justice and Police (EJPD), Professor Burckhardt took over the affiliate professorship at the University of Lausanne in 1899. It was during this period that he wrote his commentary on the Swiss Federal Constitution. In 1905, he returned to the Federal Administration as a member of the executive board of the Department for Legislation and Administration of Justice of the Federal Department of Justice and Police (EJPD). At the same time, he acted as an honorary professor at the University of Bern, where he was also appointed Professor Ordinarius for constitutional and international law in 1909. Die Rechtliche Natur Der Personenverbande Im Schweizerischen Obligationenrecht, Diss., Bern 1896. Politisches Jahrbuch der Schweizerischen Eidgenossenschaft (co-authored by C. Hilti), 27. Volume, Bern 1913. Die Organisation der Rechtsgemeinschaft, Untersuchungen über die Eigenart des Privatrechts, des Staatsrechts und des Völkerrechts, Zurich 1927. Methode und System des Rechts. Mit Beispielen, Zurich 1936. Einführung in die Rechtswissenschaft, Zurich 1939. Aufsätze und Vorträge 1910–1938, Bern 1970.